? ?Accountancy board executive directors from 376 jurisdictions were present at the 26th NASBA Annual Conference for Executive Directors and State Board Staff, March 2- 5 in Austin, TX, the city in which the first such conference was held. The executive directors exchanged advice on dealing with common board issues. Mobility legislation was the most frequently mentioned current activity of the boards, as many executive directors reported on the progress of such laws and their implementation through rules. Executive Directors Committee Chair Viki Windfeldt (NV) moderated the “Roll Call of States” that required each executive to briefly summarize latest developments in his or her state. Among the issues mentioned besides mobility were: Arkansas has been conducting continuing professional education audits and imposing fines on those licensees who have not met their requirements. California is working to eliminate its multiple pathways to licensure by 2012. Guam has regained its special fund status and now has its own budget. Illinois has re-instituted provisional approval to take the Uniform CPA Examination while still completing the education requirement. Indiana is reviewing its continuing professional education rules, which currently limit self-study courses to 50 percent of the total submitted to complete the requirement. Maryland has been designated a specially funded board and is re-engineering its processes to be completely on-line. Missouri has added a provision to its rules that non-CPA owners of firms must be of good character. Nebraska will launch an on-line license renewal this spring. Nevada is scanning all of its documents to become a paperless office, but they are not throwing away their files yet. New York introduced on-line renewals this year, although only about one quarter of those filed were done on-line. North Carolina is working with the AICPA on increasing the transparency of its peer review process by the NC Board’s receiving a list of those firms that had opted not to make their peer review reports available to the Board. Oklahoma is discussing how to renew the licenses of out-of-state residents, such as those serving in the military. Tennessee is working to have its board obtain semi-independent status. 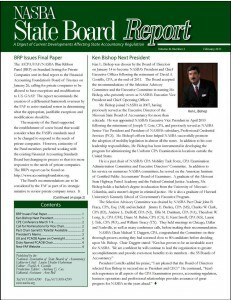 Texas is distributing materials for its board meetings electronically. Virginia for five years has conducted audits of all its licensees’ CPE reports and now has 100 percent compliance with its CPE requirements. Washington state is considering how to discipline CPAs who perform substandard work on tribal property. The executive directors suggested solutions to their colleagues’ challenges and asked for details on programs that were working well in other states.